After hard years in exile for a crime he didn’t commit, Benjamin Barker, now Sweeney Todd, returns to London to find his wife dead and his daughter in the hands of the evil Judge Turpin. In his anger, Sweeney goes on a murderous rampage on all London. With the help of Mrs. Lovett, he opens a barber shop in which he lures his victims with a charming smile before casually ending their lives with a flick of his razor across their necks. But not one man nor ten thousand can satisfy Sweeney’s lust for vengeance on those who’ve caused his years of pain. Sweeney Todd has to be one of the most challenging musicals the society has ever put on. 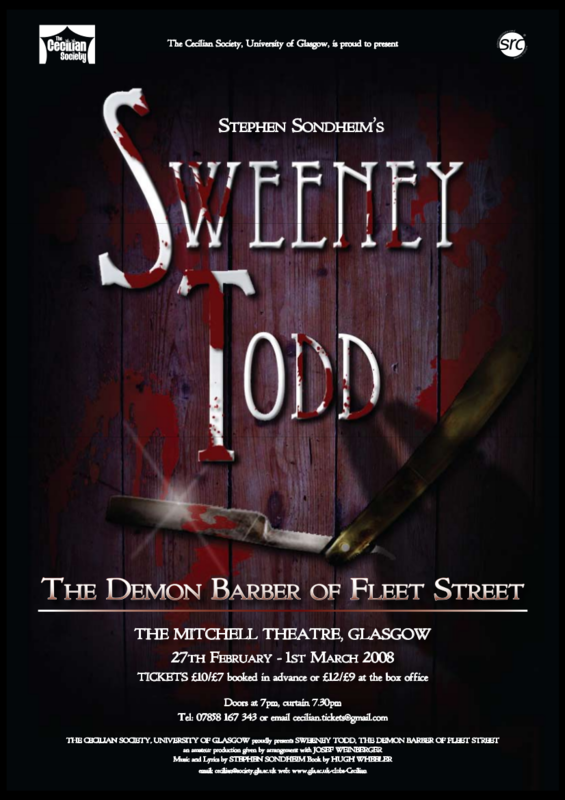 From a musical standpoint, many look back on Sweeney Todd not only as a great achievement vocally, but instrumentally, and it proved that ‘the really difficult shows,’ aren’t beyond us! Dress rehearsal photography by Linda Morrison. Other photographs contributed by the cast and crew.